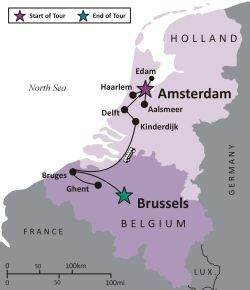 The Low Countries of the Netherlands and Belgium embrace the North Sea which over the centuries has become a vital part of their cultural and even physical fabric. The two small countries in Northern Europe are positively bursting with cultural and artistic riches, offering a journey through the Old World that is unlike any other part of Europe. The region is home to innumerable quaint towns with gravity-defying houses built on top of labyrinthine canals, golden cities with celebrated museums featuring some of history’s greatest masterpieces, fairy-tale castles, unspoiled farmland cut with canals and dotted with windmills, and picture-perfect countryside carpeted with millions of flowers, all straight from the pages of a storybook. Fabulously historic, filled with the cutting-edge art, both old and new, the cities of Amsterdam and Bruges are full of unexpected riches: romantic canals, watery landscapes which inspired Vermeer and his contemporaries, imposing architecture and creative cuisine (topped with the world's best chocolate! ), and getting to know this part of Europe offers unforgettable rewards of having truly experienced the Old World. The Masters and Artisans Tour will start in the Netherlands' fabulous capital city of Amsterdam. From our base of an upscale, boutique hotel in the city center, we'll experience both the most famous and the most unique aspects of this city. We'll take a dinner cruise in the labyrinth of the magically lit canals, visit Anne Frank's House, the Rijksmuseum and the Van Gogh Museum, set out to explore Delft and Haarlem, witness a flower auction in Aalsmeer, visit the world's most beautiful spring flower garden in Keukenhof, bike through the storybook Dutch countryside and be awed by the windmills of Kinderdijk. Throughout the tour we will dine in carefully selected restaurants and sample delicious Dutch cuisine along with the classic Dutch beers. The second part of the Masters and Artisans tour will take us to Belgium, where from the base of our hotel in the historical center of Bruges, we'll explore Brussels and Ghent, as well as the ancient city of Bruges itself. We'll take a walking tour focusing on the Art Nouveau architecture in Brussels, tour a chocolate museum and even make some of our own chocolate. We'll take a romantic cruise on the peaceful canals of Bruges while admiring the traditional lifestyle of its people, and while in Ghent, we'll bask in the town's youthful energy, reflected in its mix of Gothic and contemporary architecture. We will enjoy the typical Belgian meals and drinks, as we dine in carefully selected restaurants. All sightseeing fees and cultural activities, as per itinerary. Additional/optional costs may include: optional single room supplement, optional travel insurance, meals not included in the itinerary, early hotel check-in, optional tour director gratuities, telephone charges, laundry, personal expenses. Wonderful tour. Lots of variety, both urban and rural. It was nice to only move hotels once. Good choice of hotels and restaurants. Can't say enough about the wonderful trip. From the hotels to the tours and the restaurants, everything was top notch and I could tell that there was a lot of thought and planning into the process. Our tour guide Kerry was fabulous, she really went above and beyond in making sure we were all well taken care of. I will be recommending Sights and Soul and look forward to taking another trip. I have traveled with another women's travel group and Sights and Soul is by far a better company in so many ways. Thanks for making the trip to Holland & Belgium a memorable experience! This was a great tour. Excellent excursions were included, great guides, restaurants were fantastic. Other tour participants were friendly. We had a great time. I loved this tour! The combination of natural beauty, artistic perfection, wonderful cities and small towns was just great. Each day brought more adventures to be excited about. The hotels, especially in Bruges, were wonderful. Adored Grand Casselburg Hotel. Food was glorious. The restaurants were so well chosen, great food and atmosphere. Finally, what a great group of women were on this tour! I’ve made a bunch of new friends with whom I look forward to traveling. This tour was amazing, from the food, sights, smells and the group of people. I have wanted to see the Netherlands and Belgium for as I can remember, and this trip exceeded my expectations and will be the trip I will always remember. Marta was amazing. She brought the tour to life and has the patience of a saint! Everything about this trip was well planned, the hotels, the restaurants, the activities, the sights, our tour leader – all outstanding. If a picture is worth a thousand words, than being there is worth a million. This was an exceptional trip. I was swept over with emotion at the beauty of the tulip fields and the flowers at the Keukenhof Gardens. The entire tour was one great experience after another, I will definitely go with Sights and Soul Travels again. Thanks again to Marta, she was a wonderful tour guide. The trip was Awesome! Marvelous! Fantastic---as always. The choices of activities, accommodations, and restaurants were superb. On a scale of 10, this trip gets an 11. Thank you and many thanks to Marta who made this trip a success. The choreographing of schedules is complex and Marta made it seamless and transparent and did so cheerfully. She is a real pro at herding cats ! I can't wait for the next trip with Sights and Souls. You do everything upscale. I like that. From the moment you land until you take off for home. Everything is planned and everything is the best that there is.